David Moyes has waited 11 years to see Everton win at Old Trafford - and when that elusive victory finally arrived it rounded off a night of misery and indignity for Manchester United's manager. Unflattering statistics and insults piled up around Moyes like rubble as he made his way down the touchline to the derision of the Stretford End and the sound of the Everton fans - who had taunted him mercilessly throughout - speculating on his long-term employment prospects. 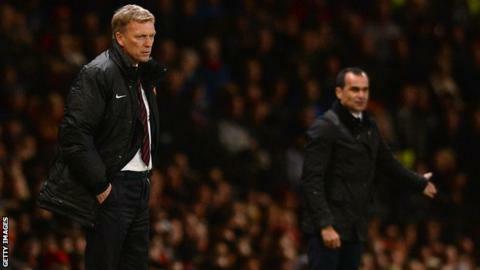 It became a scar on Moyes' record at Everton that he had failed to win at United, Arsenal, Chelsea or Liverpool in the Premier League during his time at Goodison Park. And he was certainly feeling the pain as his successor Roberto Martinez took only 90 minutes to do what he could not, Bryan Oviedo's late goal giving Everton their first victory at Old Trafford in 21 years. The scenes were sharply contrasting on the final whistle as a rapidly emptying "Theatre of Dreams", a tag that currently sags in the middle, gave a seal of disapproval to Moyes and his players after a loss that leaves them ninth in the Premier League and 12 points adrift of leaders Arsenal. Meanwhile, stage right, Martinez was taking the acclaim of Everton's supporters, among whom he is rapidly gaining heroic status, while goalscorer - and Moyes signing - Oviedo was hoisted on the shoulders of team-mate Sylvain Distin. And to add irony to the insults, Costa Rican Oviedo was the stand-in for injured Leighton Baines, the man pursued with such zeal by Moyes in the summer, and who may be again in January. If this was a tale of two managers, then it is clear one has so far made a better job of shaking off the shadow of his predecessor than the other. Moyes covered his anguish but this defeat must have hurt. He knew that grim away record was a stick his critics used to beat him, accompanied by the suggestion that a perceived default position of caution was a prime factor. So often Everton losses here have been accompanied by a lack of adventure. As Moyes said in a statement he may now regret, "you wanted to get out of Old Trafford alive"
So to see Martinez's Everton - bold, positive and sticking rigidly to the passing game their manager demands - accomplish something in a single night that Moyes could not do in 11 years made this a chastening experience. Do not let anyone suggest this was a cut-and-run Everton win. This is a team buying into a manager's methods. There may have been moments of luck when Wayne Rooney and Danny Welbeck hit the woodwork - but Everton had plenty of opportunities of their own, and Kevin Mirallas also struck a post. And it also became clear very quickly to Moyes that any reservoir of goodwill he may have had at Everton has run dry after the events of last summer. The Scot's first appearance in his technical area to dispense orders was met with a storm of jeering from the travelling supporters and some X-rated chanting. The noise levels ramped up in those triumphant closing moments and "You're getting sacked in the morning" was a predictable closing number. After initial goodwill has come anger from Everton fans about Moyes' departure - but the breaking point appears to have been his and United's acrimonious pursuit of Baines and Marouane Fellaini. Understandable too, after offering £28m for the pair then handing over £27.5m for Fellaini alone. Those numbers do not add up whichever way you cut them. On current evidence, however, Moyes may well have done Everton a huge favour by paying the price for Fellaini - £4m more than he would have cost had he activated an earlier contract release clause. The money allowed Everton to pay £13m for James McCarthy, arguably the game's outstanding player, and bring in Romelu Lukaku and Gareth Barry in the final hour of transfer deadline day. All were pivotal in this hugely impressive performance. Some suggested this was one of Fellaini's better United performances. If this is so, then it only hints at how poorly he must have been playing before. He made the odd tidy contribution but is fast becoming a symbol of the false start Moyes has made. Rooney was tireless as ever but his frustration boiled over into a reckless hack at Phil Jagielka, and Moyes did not waste too much time discussing when Robin van Persie might return from his groin injury in a post-match media conference lasting two minutes eight seconds. Moyes is not approaching crisis but the price is being paid for an awful summer in the markets, with the folly of the failure to sign high-class players underlined by too many average performers and elder players starting to creak. Put simply, no team travels to Old Trafford with trepidation any more. The title looks a distant prospect at this stage and a serious attempt at winning the Champions League is not even worthy of consideration with this squad. It was a sign of the times that United fans flooded to the exits when the visitors went ahead rather than hang on for the late surge that was the trademark under Sir Alex Ferguson but that never looked like coming to pass here. Everton, on the other hand, did come to pass - and what a night this was for Martinez. So often the losses here over the past 21 years have been accompanied by a lack of adventure. As Moyes said in a statement he may now regret, "you wanted to get out of Old Trafford alive." If this hinted at an air of resignation in the past, there was not a bit of it here. Martinez wanted Everton to go "eye to eye" with United. This they did, rode their luck at times, but few would begrudge them the three points. Everton certainly got out of Old Trafford alive and more besides. It was a performance of stature that spoke volumes for the manner in which the Spaniard has got his message over to his players. Goalkeeper Tim Howard has been revitalised and captain Jagielka was a towering figure. Barry, unfussy and composed, helped McCarthy hold sway in midfield, while Lukaku gave United captain Nemanja Vidic a night he will not want to dwell on. The loan signing from Chelsea had the sort of physical power to make Vidic's one-time air of menace and invincibility a distant memory. One brush-off by Lukaku in a physical challenge in the first half was so emphatic it actually fooled referee Martin Atkinson into wrongly awarding a foul. Ambitious from the kick-off, Everton had to weather the odd storm - but for all Martinez's commitment to attacking football, his side have kept five clean sheets in their past six matches, stand fifth in the table and have lost only one league game. Martinez spent the night in his technical area and defender Seamus Coleman revealed he was still demanding Everton get on the ball and pass even in what might have been nervous final moments. All Moyes had to show for his night was the barracking of Everton's fans and a growing realisation that the retention of the title is moving out of reach. Not since 1996 have United closed such a gap to win the title and there was nothing on show here, even taking absentees into consideration, to ease the mood of pessimism around Old Trafford. For Martinez and Everton the mood is very different. Only last week Wigan chairman Dave Whelan said his former manager "will take Everton to places they can only dream about". One 21-year-old dream has already been fulfilled with victory at Old Trafford.